Home » Viral Posts » Have you met the gentle giants of the ocean? Have you met the gentle giants of the ocean? Whales are the gentle giants of the ocean, with many species only feeding on microscopic organisms. Far from a danger to humans, their size can still be intimidating. We probably look like tiny ants to them! Eddy Willis is a frequent ocean kayaker and he often attaches a camera so he can record some of the amazing things he sees while out on the water.He's never scared of these wildlife run-ins, telling his local news channel, "To me, I love whales, I love sharks…It’s an adrenaline rush more than anything." 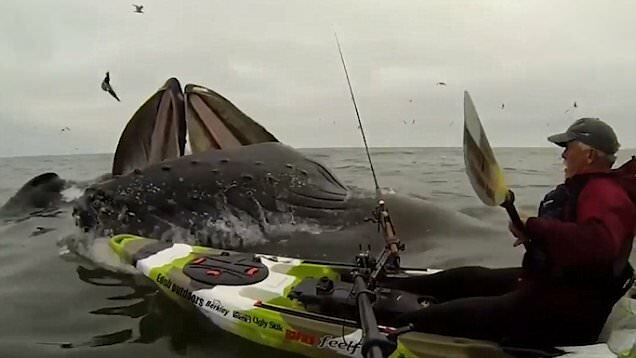 Recently, he got a bigger adrenaline rush than he could have dreamed of when two humpback whales breached right next to his kayak.He's clearly surprised by the animals, which almost topple him, but that surprise quickly turns into excitement. Check it out below.